The International Police Agency, Interpol, has announced a deal with the pharmaceutical industry to crack down on fake drugs. Twenty nine of the world's biggest drug companies will provide 4.5m euros ($5.9m; £3.9m) in the next three years to help the response to the problem. "A global effort is needed to combat this threat," Interpol said. The agency added that the lives of millions of people were put at risk every day because of it. Christopher Viehbacher, the chief executive of French drugmaker Sanofi, said: "In the case of drug counterfeiting, it can mean the difference between life and death for a patient. "It is estimated that 10% of medicines are fake and these figures can go up to 50%, particularly in some poorer countries." The money will go towards creating a new programme to improve Interpol's fight against the counterfeit industry. Part of it will be about raising public awareness of the dangers of fake drugs - particularly online. The World Health Organisation estimates that in more than 50% of cases, medicines bought over the internet, where the physical address is concealed, have been found to be fake. The head of Interpol's Pharmaceutical Crime Programme, Aline Plancon, told the BBC that the funds would be used to support countries with crime detection and help them to follow up investigations. The programme will also be tasked with rooting out and dismantling organised crime networks that sell fake brands of drugs. Sometimes, these drugs can have fatal consequences. 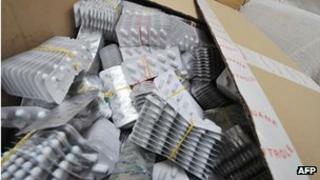 Last year, in Pakistan, more than a hundred heart patients died after taking counterfeit medicines.